If you’re like us, then you’ve been dying for Leonardo DiCaprio to finally get his Oscar. He’s one of the most talented movie stars in Hollywood, yet his stunning achievements on the silver screen have somehow never been rewarded with a nod from the Academy. 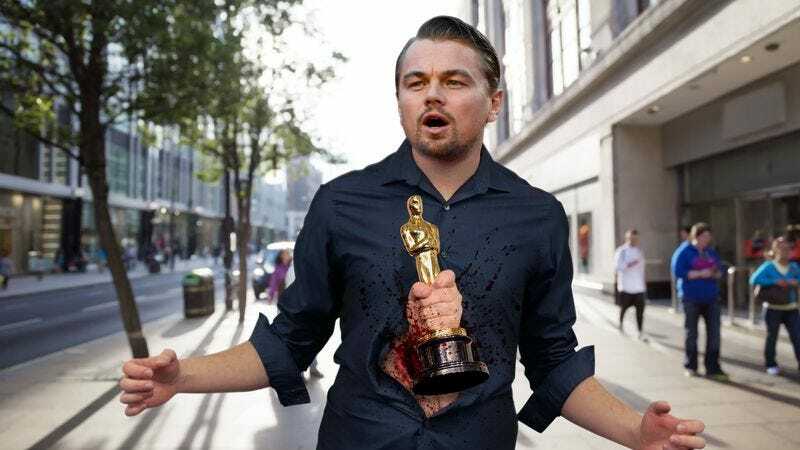 All that changed today, though, because a hand holding an Academy Award burst out of Leonardo DiCaprio’s stomach! The star of The Revenant was walking out of a trendy Los Angeles restaurant when a human arm abruptly punched its way out of DiCaprio’s abdomen, triumphantly holding an Oscar statue in the air. Bystanders reportedly cheered in excitement for the Hollywood A-lister! If you’re a fan of Leonardo DiCaprio, then it’s time to celebrate. This is truly well-deserved and long overdue. Congratulations on your Oscar, Leo! We hope that there’s more where that came from.